Caretaker is the worlds most innovative patient monitor Using only a simple finger cuff to measure Continuous Beat-by-Beat Blood Pressure (“cNIBP”), Heart Rate, and other physiological parameters enabling safe, secure, and accurate remote patient monitoring via our secure Android App, HIPPA-compliant Cloud Portals, or interfaced with other patient monitoring systems. Caretaker sets a new standard in mobility, simplicity, and cost, enabling continuous realtime monitoring as patients traverse the full continuum of care, within the hospital, during transport, and after discharge. Traditionally, accurate cNIBP monitoring has been limited to invasive catheters or expensive complicated machines used only in critical care settings. CareTaker’s low-cost, small, comfortable form factor, and intuitive design brings “ICU Quality” cNIBP capabilities to virtually any setting. The benefits of gathering blood pressure measurements continuously over a time interval are well documented and significantly better that intermittent “single-point-in-time” blood pressure readings from cumbersome upper arm cuff squeezes, which are susceptible to errors, often yield incorrect results, and can miss underlying hemodynamic problems. Using our FDA Approved finger-cuff and Pulse Decomposition Analysis technology, Caretaker non-invasively and continuously measures Beat-by-Beat Blood Pressure within AAMI accuracy standards, enabling clinicians to monitor patient vitals, pressure waveforms, from virtually anywhere. Caretaker’s integrated multi-mode radios are pre-configured to securely transmit data over cellular networks or to Bluetooth devices without the need to implement complex communications or connectivity networks. Clinicians simply attach the finger cuff and wrist unit to patients and immediately begin measuring vitals and view the data on a tablet or connected Nurse Station Monitor, alternatively the data can be transmitted directly into the Patient’s Electronic Medical Record (EMR). Because Caretaker has an integrated low-energy Bluetooth radio, it can function as a “Wearable Hub”, collecting data from other Bluetooth devices such as Glucometers, Weight Scales, Thermometers, Spirometers, etc. and display the data for remote viewing. In addition to the FDA Approved cNIBP, Heart Rate, and pulse waveform functions, Caretaker can provide healthcare staff with changing health conditions. Providing early intervention and rapid response to a patients changing health conditions. What Data Can It Provide? CareTaker is the worlds most innovative vitals signs monitor, capable of measuring Continuous NonInvasive “Beat by Beat” Blood Pressure (“cNIBP”), Heart Rate, and other parameters using only a comfortable finger cuff. CareTaker is purpose-built to either be worn on a patient’s wrist to measure continuous vital signs with maximum mobility, or to be used periodically by patients being monitored remotely. Using the on-board Bluetooth Radio, CareTaker can gather and report information from other Bluetooth devices (such as weight scales, thermometers, or glucometers), and display the data on our Secure, HIPAA-compliant web-portal; or display the information securely tablets, computers, or nurse monitors. What is the Indication for Use? 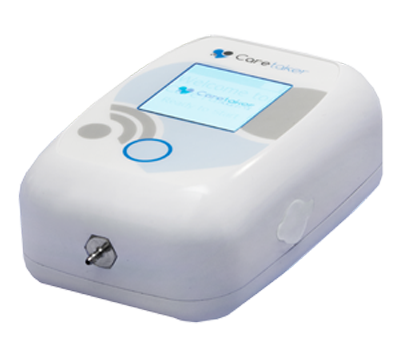 CareTaker is FDA Approved for use by clinician’s for the purpose of noninvasively and continuously measuring a patient’s Blood Pressure (Systolic, Diastolic, MAP) and Heart Rate which are derived from the pulse pressure waveform on adult patients at rest. Patients can be monitored on Bluetooth-compatible displays on a secure HIPAA-Compliant web portal. What Is the spectrum of vitals captured by Caretaker? Currently, CareTaker is FDA Approved for measuring Continuous “Beat by Beat” non-invasive blood pressure (“cNIBP”), Heart and respiration Rates, Sp02 and Core body Temperature. Pending additional FDA Approval, CareTaker will measure, Arterial Stiffness, and other hemodynamic parameters. Can the patient access the monitoring functions? CareTaker is powered by an internal rechargeable battery, which provides up to 12 hours of continuous use between charges. Can the patient shower with the Caretaker ? Although the CareTaker is water resistant to minor splashes, Patients should remove the CareTaker wrist unit and finger cuff prior to showering. The CareTaker should not be submerged in water. Does the Monitor have clinical and technical alarm capabilities? How does Caretaker integrate with a hospital network? CareTaker can be integrated into Hospital Networks using our Bluetooth radio for connectivity and our well-defined API for data integration. What type of security does Caretaker support? CareTaker uses 256 bit encryption to secure all data. Will the Caretaker solution co-exist with 3rd party software on a tablet, laptop, or desktop computer? The Caretaker software is application based and can co-exist on various hardware platforms. OEM and value added resellers can integrate the solution into their own solution architecture.